Our new Sultan Gold Lynx Chain Curtain 35.5" Wide x 6 Feet Long. This curtain includes 68 strands of Lynx Aluminum Spanish Gold chain on a matching aluminum top bar. All strands hang from one header rod and the curtain will arrive to you fully assembled and ready to hang. This curtain is made to order in-house at ShopWildThings. Please allow an additional 5 days to process. If you'd like to customize this curtain, we can make any size you'd like for $15.99 per square foot with a $75 minimum. We know you've seen these Aluminum Chain Curtains in restaurants, clubs, and high end homes. Now is your chance to get the look for less with ShopWildThings! We've been working for two years to bring these to our product line, and they are finally here, they are totally fabulous! Each curtain features 68 strands of chain. These are not just fabulous. They are so rad that we are putting them everywhere we can think of. You can use them as a room divider, in a window or in a doorway. The chain links themselves are 22mm tall (not quite an inch). We have designed a very cool header rod with holes drilled out from which each chain hangs. The header rod is silver aluminum (very heavy duty) and measures 35" wide. Some customers like to paint the rod to match the chain (in cases where the rod will show) and if you do, you can use Krylon spray paint. It's so fast, cheap and easy to do, and sticks beautifully to our silver header rod. If you would like for us to paint it for you, we can do that for a fee, just place your order over the phone! The rod is 2" tall and each strand is 72" long for a total overall length of 74" long. If this is too long, simply remove some links. 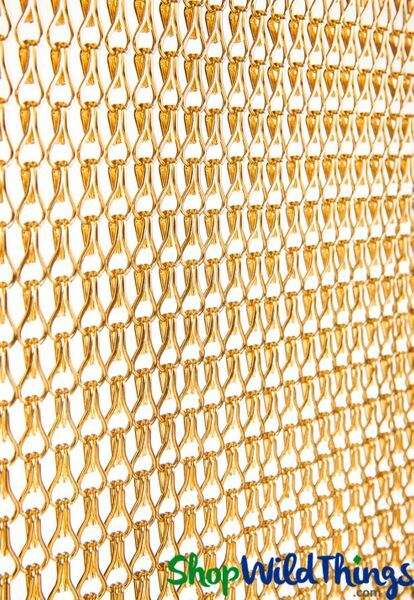 Lynx Aluminum Chain Beaded Curtain - Sultan Gold - 3' x 6' custom available!